Dr. R.L. Kashyap is Professor Emeritus of Electrical and Computer Engineering at Purdue University, Lafayette, Indiana in USA. He had his masters degree form Indian Institute of science, Bangalore and obtained Ph.D. form Harvard University. He is the recipient of many international awards. He has authored more than 350 research papers. He has guided more than 50 Ph.D. Scholars. He has written extensively on Veda. 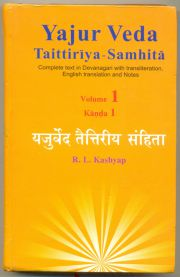 He has given the word-meaning of all the verses from the first 121 suktas of Rig Veda. He has to his credit six major books on the Veda. He is the Honorary Director of Sri Aurobindo Kapali Sastry Institute of Vedic culture, Bangalore. The book is available in 4 volumes.